​Whether you consider yourself an audiophile, or simply want to enter the world of high- quality audio, you need a pair of good speakers. Once you actually get the opportunity to take a closer listen to above- average speakers, you can hardly go back to anything else. However, finding the right speakers for your needs, and especially at a fair price point, can be pretty hard. That’s why we have decided to compile a thorough yet straightforward guide to buying the best bookshelf speakers you can possibly find on the market. So, sit back, relax, and let’s get right into it! If you are still learning about bookshelf speakers and want to check out our buying guide to help you choose, JUMP STRAIGHT TO BUYING GUIDE. SVS Ultra - Best Bookshelf Speakers. Period. 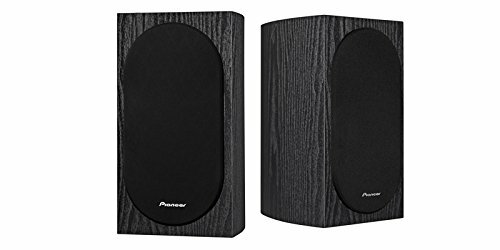 At number one, we have a pair of speakers coming from Pioneer, a brand that’s well known when it comes to audio equipment. While Pioneer offers some of the best speakers on the market, they tend to be pretty expensive. However, their SP-BS22-LR bookshelf speakers make for a high- quality listening experience, at a more than affordable price! A pair of these bad boys is definitely a bargain and a great way for beginner audiophiles and those alike. Designed by Andrew Jones, these speakers offer a sleek and minimalistic design. The black wooden casing not only looks good but feels solid as well. The front is covered with a black mesh fabric panel, and only sports a Pioneer logo on the bottom. No matter your setup, they’re bound to fit in quite nicely. In terms of performance, the SP-BS22-LR sound surprisingly good. Of course, you can’t really compare them to more expensive models out there, but they definitely outperform most speakers in this price range. Rocking a 4” woofer and a 1” dome tweeter, capable of delivering 80W of power at 6ohms, you won’t be left hanging if you go with these. With a frequency range of 55Hz to 20kHz, these puppies will give you a nice and steady low end, defined mids, as well as crisp trebles. Smaller form factor makes them great for dorm or bedroom use, versatile in terms of sound, best budget bookshelf speakers. ​Having all the needed features, and rocking some pretty neat specs, the SP-BS22-LR by Pioneer are a no-brainer when it comes to budget bookshelf speakers. Pioneer often offers a receiver alongside the speakers for a reasonably higher price, and you can always upgrade your setup with one (or more) of their speakers for a surround experience! Just missing the top of our list, you should definitely check these out! Great for a small or medium size room, these speakers will work for any budget. Klipsch decided to go for a combination of a 90x90 horn and an aluminum tweeter in order to offer very crisp and natural sounding audio in terms of the high end. The woofer doesn’t fall behind, as it utilizes graphite for minimal distortion and punchy but clean bass. Put these two things together, and you have the R-14M, a compact, yet powerful pair of bookshelf speakers, capable of reproducing any genre of music imaginable, at high levels of detail and fidelity. The design also includes a rear-firing port, in order to minimize any turbulence that may occur and lower the quality of the audio being reproduced. With peak power rated at 200W, this pair of book shelf speakers will be more than enough for a small or medium-sized room. ​Klipsch went all- in with the R-14Ms in order to provide the users with a great experience but at an affordable price point. If you don’t mind the slight lack of low end, definitely consider getting this model. You can always add a subwoofer if you want more of a kick after all! For those on a budget, you can't go wrong. While not the most "pure" bookshelf speaker. It has a great price and all the connectivity you could want. 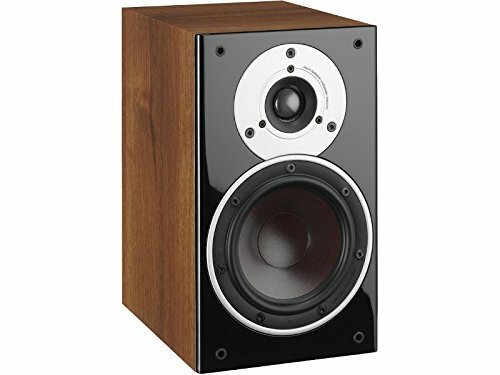 Although some audiophile purists may argue that this model isn’t something they would consider as bookshelf speakers, we just had to include it in our bookshelf speaker reviews. At number 3 are the R1700BT Bluetooth Bookshelf Speakers by Edifier, offering a higher level of convenience and practicality than most other competitor models. The design that Edifier went with is pretty interesting. Straying from the classical layout, the front of these speakers resembles more of a gaming setup. The 19mm dome tweeter on the top is coupled with a 4” bass driver, and the bottom sports a bass port in order to provide more power in terms of the low end. The right side of the “main” speaker is where the difference is obvious. There you can find three knobs, for controlling the treble, bass and volume levels. While we found the absence of a dedicated midrange knob to be a shame, tuning in a good sound was easy by using this “2-band” EQ nonetheless. There is also a simple yet handy remote control included, which you can use to control the volume, mute the speakers, as well as choose the signal source. The main feature that makes this model stand out is the Bluetooth connectivity option, making listening music from your phone or even laptop much easier and wire- free. In terms of the audio signature, we found the midrange to be the best sounding. It’s warm and smooth and manages to correctly depict the tracks we fed it. However, the bass, even at the lowest setting, was pretty overwhelming. The R1700BT wouldn’t be too far from a pair of flat response speakers if it wasn’t for the bass. If you are a fan of a more prominent low end, the R1700BT are the best budget speakers, at least in terms of practicality and connectivity. Stepping up the game in terms of price, at number four, we present the P4 bookshelf speaker pair by Audioengine. Although this brand may not be as popular as Pioneer, Klipsch, or other well- known ones, they clearly show with their P4 model that they know their business! For a mid-range price, you will be getting a pair of reliable and well- built speakers, capable of reproducing your audio smoothly and on point. Design-wise, they are pretty simple. There is no protective grill or mesh on the front, but the drivers lay flush with the front surface, making for an attractive design. You can even choose from 3 color layouts, including black, white and bamboo! Sure, design is somewhat important, but what about the actual sound and performance? The good folks at Audioengine made sure no corners were cut when it came to the drivers and electronics. A 4” Kevlar woofer handles the low end pretty well, and combined with a ¾” dome tweeter, the end result you get is above average, especially considering the price range. The audio signature is pretty close to flat response, meaning you could probably use these as studio monitors as well. With the actual casing made from thick resin MDF, any unwanted vibrations and sound reflection are easily avoided. ​At the end of the day, the P4s by Audioengine are slightly above average when it comes to the overall impressions. Build quality compensates for the mediocre highs and lows. Don’t get me wrong, they still sound good, but there is still some room for improvement. This mid-size to large bookshelf speaker packs a punch and it faired well against the others in the price range. Once again a pair of speakers designed by Andrew Jones, but this time, coming from ELAC. The B6 Debut Series high-end bookshelf speakers are a little more expensive, but offer much more than you would expect from speakers in this price range. Being the biggest of ELAC’s Debut bunch, the B6s were expected to punch away, at least in the lower end. But did they manage to meet the expectations? Sporting that classic German look, this model somewhat resembles a sports car. Even though the design is pretty standard and straightforward, there’s something that’s sleek and premium- looking about it. Whether you go with the mesh on the front or not, it will definitely fit in with the rest of your gear quite neatly. But did ELAC manage to follow through with the performance as well as they did with the design? Being on the larger side definitely helps with the audio signature and presence. The sound is balanced, yet manages to make certain frequencies stand out when needed. It’s no wonder as they feature a 25mm tweeter alongside a 165mm woofer. All of the little details in the recordings come through nicely, making for a very spacious and vibrant listening experience. 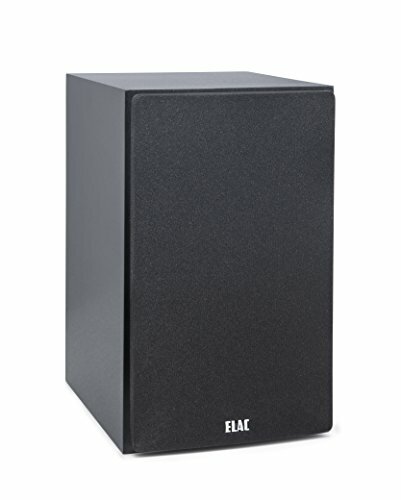 ​All things considered, the B6 Debut Series by Elac are a great option. Though you may not consider them to be small bookshelf speakers, the additional size and weight are compensated with pleasing levels of fidelity. These were previously too expensive, but can now be found in the mid price point which is perfect for those on a smaller budget. 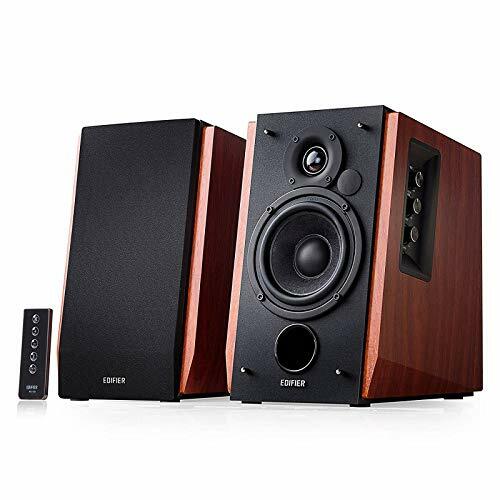 At number six we have a great alternative to the previously mentioned R1700BT, the S1000DB also by Edifier. At one point it was considered as too expensive given the specs and features it provided. But now, after a massive price drop, these shelf speakers are more than reasonably priced. Visually, they boast a different design than their older brother model. 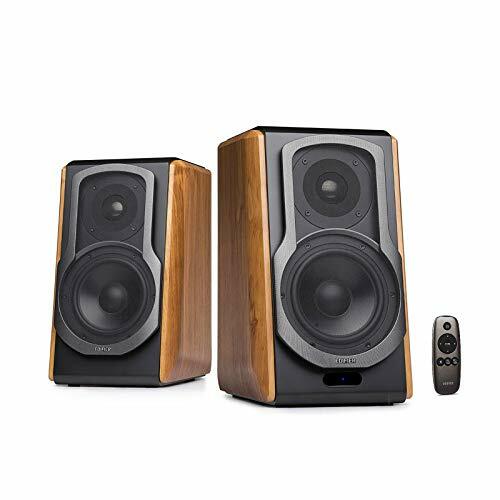 The natural wood and black color contrast demonstrate the combination of good old hi-fi audio and the new, convenient Bluetooth technology this model offers. A titanium tweeter is used in order to achieve a much smoother response and overall sound quality in terms of the high end. Alongside them are the 5.5” drivers that manage the 120W of power quite nicely, and delivering a punch. A balanced and natural punch, but a punch nonetheless. At first, the mids sounded a bit muffled and lacked clarity, but after a few days, they were ready to show their full potential. The vocals had no trouble of standing out, even when listening songs that were known to have them masked behind various other instruments. The slanted design is what makes this tweeter and bass driver combination sound so good. This allows the speakers to project a more spacious and direct soundscape while still maintaining fidelity and clarity. As with the R1700BT, you get the neat Bluetooth function for extra versatility, as well as the remote control. Besides the Bluetooth and auxiliary inputs, there is an option for using optical and coaxial inputs as well! ​With a disadvantage that many people don’t find as a problem at all, the S1000DB by Edifier is a great alternative for anyone that found the R1700BT to be missing a feature or two. Coming from Dali, a Danish company, the Zensor 1s were previously considered as the best bookshelf speakers in the mid price range. Even though they may not be number one anymore, they are still amongst the top-rated bookshelf speakers on the market and have a lot to offer. 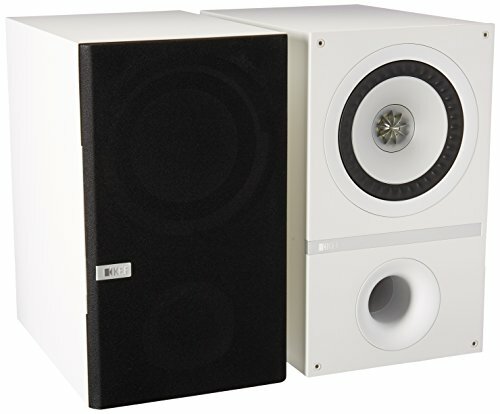 The Danish are well- known for their unique design, and the Zensor 1 speakers are no exception. The actual cabinet is CNC machined, and made from MDF, with all of the insides carefully put together by a team of professionals. The combination of wood on the top, bottom, back, and sides, and aluminum on the front makes these speakers a pleasure to look at, and not just listen to. Feature-wise, the Zensor 1 speakers come with a high- class lightweight tweeter usually integrated into much more expensive models. It’s also followed with noise dampening material in order to provide the best possible environment for the sound to travel. A 5.25” woofer below complements the tweeter nicely. With partial magnetic shielding as well, this model is definitely well built and thought out. Probably the first thing you’ll notice once you power these on is how close they are to flat response monitors. The balance between them sounding natural, but still managing to convey loads of color at high accuracy is astounding. The woofer, while definitely being noticeable, stays true to the audio being played, and is rich in depth. ​Unless you need a pair of speakers for a very large room, the Zensor 1 audiophile bookshelf speakers are definitely a great option to consider buying. These are our favorite mini bookshelf speakers under. You can't go wrong if you can afford them. At number eight, we have a pair of speakers coming from Canada. PSB was founded 40 years ago, and in that time, they have managed to deliver some of the best shelf speakers on the market. As the name suggests this model sports a slightly smaller and more convenient form factor. Coming in at only 9” in height, the Minis will easily fit any bookshelf, and will definitely look good if you plan on wall mounting them. They are easily one of the best small speakers you could get. Design-wise, they are pretty appealing. The link we’ve provided you with is for the glossy white model, but there are a couple of other color schemes to choose from as well. The contrast between the white body and black/ brass colored drivers adds a nice touch to these sleek looking puppies. Don’t be fooled into thinking that the Imagine Minis by PSB are all looks and no show. With heavy bracing on the inside, any unwanted vibrations are suppressed, making them sound even better, and guaranteeing a sturdy and solid build as well. PSB went to great lengths when actually testing out the Minis. The performance was measured in an anechoic chamber, meant to simulate an infinitely large room, so the true sound of the speakers could be tuned to an optimal level. That kind of explains the surprisingly good performance from speakers of this size. The broad soundstage and depth of the audio are at levels you would expect to get from much bigger speakers. Though there could be more detail present, the overall impression was far from average. 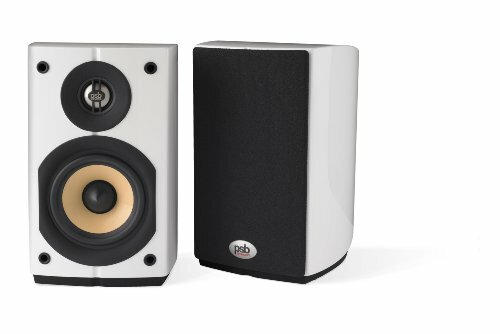 ​The Imagine Mini by PSB are one of, if not the best speakers under $500. If the SVS Ultras aren't your style, these are the best money can buy. KEF is mostly known for the fact that they introduced the coaxial design to a wide audience, and sort of pushed it into the mainstream. The Q300 is yet another model from their Q series, an assortment of some of the best bookshelf speakers under $1000 you can find on the market. No matter which model from the Q series you end up choosing, you will be getting the same treatment in terms of design and appearance. The Q300s are the largest of the bunch, which means that they offer a lot of space for the sound to travel, as well as big and high-performance electronics. The cabinets boast a premium MDF build, which you can tell is pretty sturdy right away. Depending on the finish you choose, you either get a sleek white look, or a more natural, wood- grain vinyl design. As we have previously mentioned, the most prominent feature of the Q300s are the coaxial transducers. With a 1” dome tweeter and a 6.5” aluminum cone woofer, you can really notice the difference. Regardless of the amplifier you decide to pair these bad boys with, you can expect a massive sound that won’t lack clarity no matter the volume level or EQ setting. In terms of the actual audio signature, the lower and mid-range are accentuated, but not too much. Enough for the tracks to get a decent representation, without any part of the spectrum getting blown out of proportion. However, not everyone will appreciate that mid-range boost, so keep that in mind! ​So, are the Q300s worth the money? Definitely, unless you don’t mind the slightly more colorful mids and lows! If money isn't a concern, treat yourself to the best bookshelf speakers that you can get. Reaching high price points, the expectations go up as well. For upwards of a grand, we are looking at the SVS Ultra. Regarded as the king of most top 10 bookshelf speakers reviews, they truly push the limit to new extents. Top notch black oak veneer with premium bracing makes the SVS Ultras sleek yet pretty tough and durable. The “piano- gloss” finish adds a nice touch to the already aesthetically pleasing look. The cloth grill choice contributes a touch of old school to the otherwise all- modern design. As far as features go, this model is just loaded with them. A 1” aluminum dome tweeter is placed in an FEA optimized diffuser, which clearly shows that SVS is aiming very high. A 6’5” woofer boasts a glass fiber build, which, even if you’re not really familiar with speakers, is clearly a premium choice of materials. The hardest about reviewing this model was comparing it to the others we’ve mentioned so far. Even though the difference in price between the SVS Ultra and KEF Q300 is pretty small when it comes to bookshelf speakers, accurately and objectively comparing them was definitely a challenge. Keeping things simple and straightforward, the SVS Ultra sound amazing. The most prominent feature is definitely the sheer transparency you can hear and feel across the whole range. Unlike other models, the whole range retains a good and rich tone color and accurately portrays tracks you feed the speakers with. ​While the “higher the price = higher quality” can’t always be applied, the SVS Ultra clearly show that if you decide to spend more on a pair of bookshelf speakers, you will be getting the value of every cent. Coupling these bad boys with a good receiver or amp will open a brand new world of hi-fidelity audio, after which you simply won’t be able to enjoy anything of lower quality. Before we go over the actual models we have chosen for this buying guide, you should familiarize yourself with the concept of bookshelf speakers, what they are, how they work, and what are the main specifications and features you should have in mind when choosing them. What exactly are bookshelf speakers? High- performance speakers used for a discrete audio system, mainly for enjoying music at your home. These speakers are connected to a dedicated music player, or an amplifier, thus making the whole rig a standalone music system. With that in mind, the actual term Bookshelf speakers is a bit more clear. They are to be used as an individual audio setup, not connected to your gaming console or TV for watching movies. 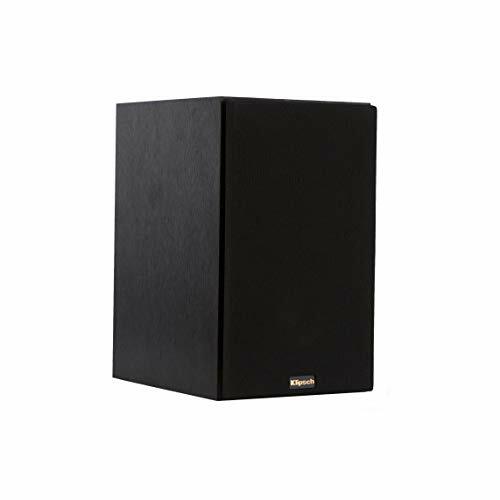 Unlike surround speaker systems which most people utilize for TV and movies, as well as listening to music, bookshelf speakers come in a different form factor. Most of the time, they combine a small driver (tweeter) meant for the higher end of the spectrum and one bigger driver (woofer) for the low end and part of the mids. The fact that they are designed in this way means that just by having a pair of them, you cover the whole range, eliminating the need for a separate subwoofer or woofer. While some models can come in bigger form factors, do not underestimate the smaller ones! Sure, the actual volume (in terms of space) is an important factor, especially for the low end, but there are different techniques that manufacturers utilize in order to compensate for being on the smaller size. You will see this in the actual review part, as we listed some models that feature conveniently small dimensions but can pack quite a punch as well. When sound systems first appeared, the most common form factor they came in was a single unit, with the player, amplifier, and speakers all built- in as a standalone device. Individual speakers that offered high-fidelity audio were not just rare, but pretty expensive as well. With electronics becoming more and more developed, the first bookshelf speakers, or better put, their predecessors, came to be. More compact devices were made, capable of reproducing a wide range of sound, but still small enough to be used at home. Pro Tip: Do not mix up bookshelf speakers with computer speakers! Sure, they may look very similar, sporting that tweeter and woofer combination, but there is a key difference. Computer speakers are meant to be used as a simple way of reproducing sound that’s coming from your computer, and not much more. Bookshelf speakers, apart from being an almost self-contained system, offer a high sound- quality level, meant for enjoying music at a level higher than most consumer- grade models do! Do I need these speakers, and who are they for? 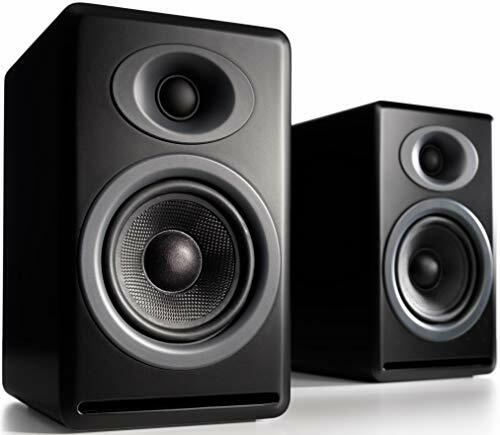 Generally speaking, bookshelf speakers are used by many people, ranging from “amateurs” who value above-average audio reproduction, to audiophiles. Being an audiophile, and going for “audiophile-grade” equipment sadly means that, most of the time, you need to spend a lot of money. Bookshelf speakers tend to cover a wide range of different models, from the more reasonably priced, to the crazy expensive ones. Our idea is to present the cheaper options, as well as the pricier ones, so you can choose in accordance with your budget. This type of speakers allows you to explore your favorite music in a very different way than you have so far. It’s almost like when you compare a full HD video with a VHS one. Bookshelf speakers can often show you colorful details in songs you’ve been listening for ages, but just didn’t have the right audio equipment to be able to notice them! The bottom line is this: If you consider yourself as someone that appreciates music, and wants to step the listening experience up to a higher level, bookshelf speakers are a great way of doing so! Passive and active speakers – What’s the difference? When browsing different types of speakers, bookshelf ones included, you will often come across two main types- Passive and Active. In the world of bookshelf speakers, a great majority of models are passive, meaning they need extra power that comes from an amplifier, in order to operate. Simply put, this means that your rig would consist of a music source, a receiver or an amplifier, and a pair of speakers. Opting for a pair of passive speakers means that if you don’t already have one, you will need to buy a receiver or amplifier. It’s important to note this, not only because it’s crucial for the whole rig to work, but because you need to balance your budget in order to cover for speakers as well as a receiver! An alternative to a full-blown receiver is a smaller, more simple and straightforward stereo amp. It works in a similar fashion as a receiver, as it picks up the signal from your audio source, and feeds it to the speakers alongside the extra power that the speakers require. 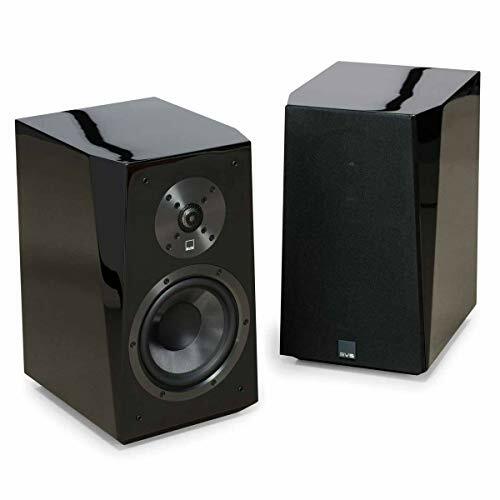 When you’re looking at different bookshelf speaker models, you will notice that they offer varying performance in terms of the basic specifications. However, in order to correctly choose and match speakers with an amplifier, there are two things to make sure are matching, or better put, are compliant between these two devices. Wattage tells you the actual power of the speakers. Besides the factors in terms of the size of the room you’re going to use the speakers in, it’s important that the amp and speakers meet wattage- wise. Most speakers come somewhere between 30 and 50W each, which is somewhat of a standard when it comes to amplifiers. Going with a pair of speakers with this much power is a safe bet. The easiest way to know that you’ve mismatched your speakers and amp is if you turn the volume up more than 50% on your amp, and the sound your getting seems distorted and downright bad. Using your setup this way will damage it, so take extra care when choosing your rig! On the other hand, if an amp is not powerful enough, you won’t get a decent experience unless you turn the volume all the way up. It goes without saying that this isn’t good for your devices, and you should get a more powerful amp. Impedance is as important as wattage. The general rule of thumb is making sure that the amp you’re using offers lower impedance than the speakers are. The lower the impedance, the more power you get. By knowing this, you can play around with different setups. Pro Tip: If you hook up a pair of, for example, 8-ohm speakers to a 4-ohm 100W amplifier, the amp is actually working at 50W per speaker. So, in order to get the most out of your amp, you could hook up an extra pair of 8-ohm speakers for it to work at full power! Though this may seem a bit too complicated at first, after some time you will get the idea. At the end of the day, playing it safe and not pushing your equipment to the limit will certainly give you a great listening experience as well. Volume ratings – how much dB do I need? The actual sensitivity or efficiency of the speakers is measured in decibels (dB). This tells you how loud the speakers are depending on the volume you set. This specification is important when you’re planning on using a pair of speakers in a slightly bigger room. Lower speaker sensitivity (up to around 96dB) is in most circumstances enough for your bedroom for example. Anything more than that, and you’re looking at speakers designed for a living room or any other occasion where you might need some extra volume. So, when you’re comparing various models, you should have a rough idea of the dB you need for your particular case. Depending on the model you go with, the speakers will either come with pre-installed wires or with no wires at all. If the first one is true, connecting the speakers to your amplifier is pretty simple and straightforward. However, before you actually do anything, make sure that everything is unplugged in terms of electricity. If you’ve ever played an electric guitar or bass, or simply connected any type of speakers to an audio source, you’re familiar with the pop that can occur if the devices aren’t turned off. This happens because you feed the speakers with a signal that can be very powerful, in an instant. It’s pretty logical that this can lead to the speakers getting damaged, so pay extra attention when connecting any audio device to a source/ amplifier! Back to the actual process of connecting: you will most likely see two wires, a black and a red one. Match the colors of the wires and the connectors on the back of your amplifier. The connectors either look like two screws with a hole on the bottom, which is exactly where the wire should enter. Once you’ve made sure that the exposed part of the wire is not frayed, pop it inside the hole and tighten the screw. On the other hand, if you’ve purchased a pair of speakers that don’t have the wires preinstalled, don’t worry, as the process is simple nonetheless. You need to buy some speaker wires first. Going with 16-gauge wires is your best bet, as they work fine, offer compatibility with 8-ohm speakers, and aren’t expensive at all. Before actually buying the wires, measure out how much you need, and get a few inches extra just in case. Once you’ve cut the wires to the needed length, use a box cutter or a sharp knife and strip off the insulation off both ends. Twist the now exposed wire ends until they feel tight, and pop them in place on both ends, the speakers, and the amp. That’s it, you’re good to go! Depending on the acoustics of your room, its size, how much furniture you have, and other factors, you need to find a good place for your speakers in order to get a good listening experience. Pro Tip: The easiest way to do this is to place them so that height- wise, they are leveled with your ears, and form a triangle, with your head being at the tip and the speakers at the two points of the base. Note that putting the speakers on a table, an actual bookshelf, or mounting them on your wall will yield different results, mainly when it comes to the low end. If the speakers are placed on something hollow, or capable of resonating, you will get a noticeably different experience, mainly the bass will tend to overpower the higher frequencies. You can always fine-tune the equalizer on your audio source, or the speakers themselves, depending on the model, in order to compensate for this. Speaker stands are a great thing to consider when buying a pair of bookshelf speakers. First of all, if you go with a pair that is too large to fit on your actual bookshelf, and for some reason don’t want to mount them on a wall, proping them on a stand is a great way to save space. If you’ve been to an audio equipment store, chances are that you’ve seen most models that you can try out propped up on stands. Sure, one of the reasons for that is saving precious space inside the store. However, the more important reason for doing so is because speakers tend to sound better if propped up on stands. Both the frequency response and stereo imaging tend to stand out this way. Just make sure that the stands you’re considering to get can support the dimensions and weight of the speakers! Bookshelf speakers as a part of 2.1 and 5/7.1 setups? Even though we’ve already covered the main advantages and general use of bookshelf speakers over other types, you might still be wondering how you could potentially upgrade this stereo setup to a more advanced one. If you’re looking for a more serious setup than a one with just two speakers, we suggest you combine a pair of good sounding bookshelf speakers with a subwoofer instead of going with a premade 2.1 system. Adding a subwoofer to a stereo setup is pretty simple. As most subs don’t need additional power, you can simply connect one to your amp by plugging it in the dedicated port on the back. If, however, your rig consists of a stereo amp, there is a solution as well. You can connect the two speakers to the subwoofer, as most offer inputs as well as outputs, and then route the actual sub to the amp, as it covers the two speakers as well. In terms of 5.1 or 7.1 systems, you will need a good enough receiver with enough power as well as ports in order to hook everything up. As most speakers are sold in pairs, you will be left with a spare, which you can use as a backup. So, you’ve had the chance to understand and learn a couple of crucial things when it comes to bookshelf speakers. Our extensive bookshelf speaker reviews showed the main differences and types of approach between various brands and their models. But you’re still wondering which one you should get? ​That pretty much wraps things up! Whichever of the models we’ve gone over you end up choosing, you won’t be disappointed. Utilize everything you learned by reading this article, pick carefully, and soon enough you will be enjoying your favorite music at a whole another level! Just be careful, as once you’ve experienced true high fidelity audio, you can hardly go back! Hi! Great list you got here. I can’t find the Edifier S1000DB in our place. What do you think of the Edifier R2000DB instead? Those are a great replacement if you can’t find stock of the S1000DB. The 1000DB made it into our list due to the price reduction. We love the speakers, but they were a bit expensive. If you have the budget for it, the R2000DBs will work great.